SALES OF IRISH cream liqueurs rebounded during the past 12 months at home and abroad as the category recovered from a ”lost decade”, according to the Alcohol Beverage Federation of Ireland (ABFI). Comparing this year to a period of particularly poor growth for the Irish cream liqueur category between 2012 and 2016, the group that represents Ireland’s drinks sector showed that sales markedly improved in 2017. Preliminary figures from international market research firm Nielsen have shown that Irish cream liqueur sales are up 3.4% this year, which will bring total bottles sold worldwide close to the 100 million mark. Sales of cream liqueurs in the Irish market dropped by more than a tenth between 2012 and 2016 – a decrease from 108,000 to 95,900 cases. 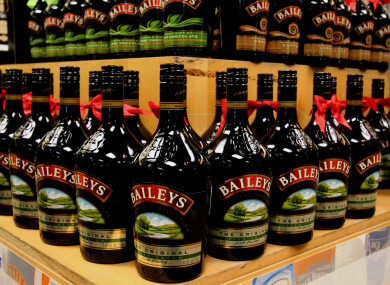 Earlier this year, financial results for drinks producer Diageo also showed that its Bailey’s brand has undergone a complete turnaround over the past two years. The liqueur had global sales growth of 5% in the year to July 2017, with exports hitting €487 million. The Bailey’s brand also performed strongly in the Republic, where sales grew 7%. The analysis of the Irish cream liqueur category was released as part of a wider assessment of the alcohol sector in Ireland by the ABFI. Preliminary figures for 2017 show that overall spirits exports from Ireland were up by 13% in the first nine months of this year to €646 million. The drinks group’s report reaffirmed that Irish whiskey – the fastest-growing spirits category in the world – is leading this growth due to its exports. Whiskey exports in the first three quarters of 2017 topped €412 million – a 14% increase on the same period in 2016. The whiskey sector is going through a renaissance at the moment, driven by major players like Jameson producer Irish Distillers and also an ever-increasing volume of independent producers. At the start of 2013, only four distilleries were in operation in Ireland, but now there are 16 distilleries in production. Some 15 new facilities are at the planning phase – including Diageo’s new distillery in Dublin 8 – and it has been forecast that investment in new distilleries between 2010 and 2025 will reach €1 billion. Another driver of the spike in spirits sales is gin, which is now the fastest-growing spirits category among Irish consumers. Exports of Irish-produced gin more than trebled this year due to an increase in small, independent distillers. The boom of new spirits producers – particularly whiskey distillers – has led to warnings from some senior industry figures that many new distilleries could struggle to become commercially viable due to the three-year maturation time needed for a product to be sold as Irish whiskey. Despite the resurgence of spirits in Ireland, beer has remained the most popular alcoholic beverage in the Republic with a market share of 46%. Wine is the second-most popular with just over a quarter share of the market. However, preliminary figures for 2017 have indicated that beer consumption has decreased marginally in 2017. Ireland is the EU’s 12th largest producer of beer and 8th biggest exporter. The Irish craft beer revolution has seen a lot of independent breweries pop up nationwide, while the number of microbreweries has also skyrocketed. In 2012, there were only 15 microbreweries in Ireland. Last year, that figure was up to 62 and the ABFI has claimed that the number will be closer to 100 by the end of this year. Alcohol producers in Ireland spend €1 billion on purchasing grain and dairy products from Irish farmers every year. Email “Irish cream liqueurs are finally recovering from a ‘lost decade’ of sales”. Feedback on “Irish cream liqueurs are finally recovering from a ‘lost decade’ of sales”.